What do you think about the idea of renting an electric bicycle from a well-known car rental company? Also, would you consider to get an electric bike instead of a courtesy car when your car is being fixed? Hertz, the world's largest general use car rental brand, offers to customers to rent an electric bike in Spain and London. In spain, there is a choice of nine different Swiss Flyer electric bikes that are available for 24 euros a day when booked at least 24 hours in advance, or 28 euros for booking on the same day. 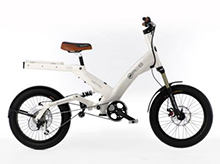 This e-bikes are equipped with Lithium-ion batteries that support travel at up to 25 kilometers an hour, with a range of 85 kilometers. The services comes with full training, a helmet and road safety vest to ensure customers feel at their safest when exploring tourist destinations. In London, Hertz offers the Ultra Motors electric bikes. The London electric bikes travel at a maximum speed of 15.5 mph and can be rented at a day rate of £20. Customers receive full training, a lock and helmet, as well as a copy of the AA Leisure Guide to London with suggested bike routes around the capital.